Over the weekend, I spent my time talking with MLAs, exploring the legislature, and engaging in debates about the issues of our province. On the first day I was there, I was introduced to the Alberta Legislative Assembly, namely the MLAs. We sat through an exciting, heated debate and it was most interesting. The atmosphere was cheerful, with MLAs cracking jokes every once in a while. The day was packed from morning to night, filled with tours around the gorgeous legislature building, and question periods with former MLAs. On the last day, I was given the opportunity to spend the day with MLA Jamie Kleinsteuber, the MLA of my area. We discussed issues concerning our province. As our day together came to a close, he left me with a souvenir: a gold pin with the Alberta legislature building minted on it. In the end, MLA for a Day was not only a fun trip, but an educational one as well. 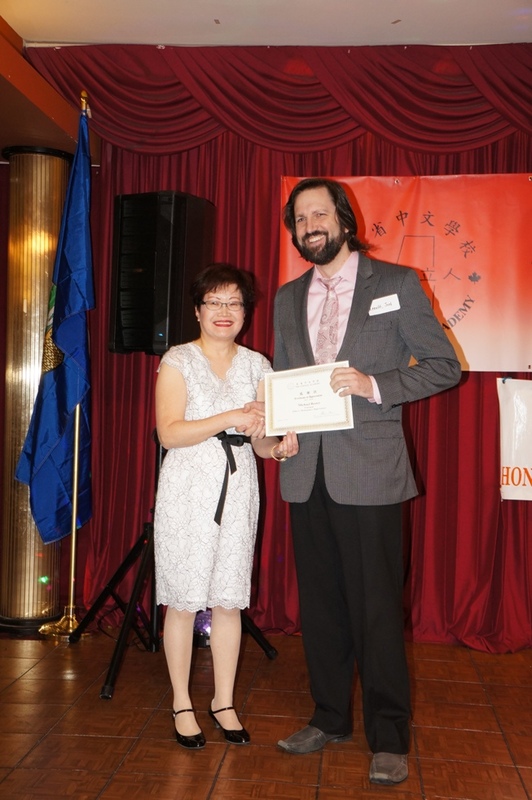 I would like to thank MLA Karen McPherson for encouraging The Chinese Academy students to apply. Also a thank you to MLA Kleinsteuber for the experience and The Chinese Academy for sending me on this awesome and educational journey! Hi everyone, my name is Joel Leavitt and I’m a teacher at John G Diefenbaker High School. I’m really happy that I have a chance to chat about why I chose to study Chinese, why it’s important to study Chinese and my feelings about Chinese in general. When I was 19 years old, I began to study Chinese. In university in the States, I was required to choose a second language to study. I chose Chinese because I really liked the beautiful characters. A couple years later, I went to Taiwan to continue studying Chinese and to teach English to some kindergarten kids. After 3 years in Taiwan, I moved to Canada where I enrolled at the University of Calgary to study Chinese language, Chinese culture and Chinese history. Even though it was not easy to study Chinese and was difficult at times, I believe that the studies have really helped me in life. I am able to help newcomers to Canada, especially new arrivals from China that may not have strong English skills. Even though my Chinese is still not great, I still try to practice everyday. I am not afraid to make mistake which helps me to improve. I hope all of you can come and try to practice with me so we can study Chinese together. Thanks everyone! Copyright ©2016 The Chinese Academy. All Rights Reserved.